as many of you are working on your thanksgiving day menus, i thought now was the perfect time to share this wonderful dessert that i made a few weeks ago. when i first saw the recipe, i realized that i’d never tried pears + chocolate together, at least not any time recently, + was intrigued by how the flavors would work together. thinking about it, i realized that they could be an interesting, tasty combination, plus the recipe had received very positive reviews, so i decided to give it a try. let me say, i’m so glad i did. the pears work amazingly well with the chocolate + almond body of the tart, which is rich, perfectly textured, + delicious. also, this tart turned out absolutely beautiful, which for me is a major plus for a thanksgiving dessert. in many families, the thanksgiving desserts sit out on prominently on a dessert table for everyone to admire before diggin’ in, + this tart would definitely be one of the stars of the table with its gorgeous crimped edges, deep chocolate color, + delicate sliced pears. 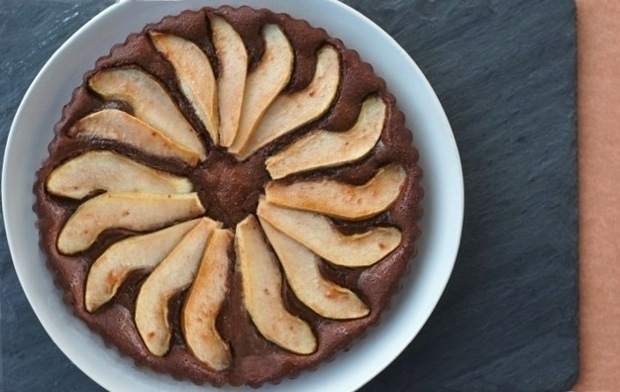 so, if you’re looking for a new dessert to try for your thanksgiving this year, think about trying out this chocolate + pear tart. i loved it, + i’m sure you + your family will, too! preheat oven to 350 degrees. brush a 9-inch removable-bottom tart pan with butter; set aside. in a food processor, combine almonds + sugar; process until very finely ground. add butter, eggs, cocoa, vanilla, salt, + almond extract, if using; process until combined. spread mixture evenly in prepared pan. peel, halve, + core pears; cut lengthwise into 1/4-inch-thick slices, rubbing them with lemon as you work (to prevent discoloration). arrange slices on chocolate mixture, slightly overlapping, without pressing in. place pan on a baking sheet; bake until top is puffed and a toothpick inserted in center of chocolate mixture comes out with only a few moist crumbs attached, 45 – 50 minutes. cool completely in pan. briefly heat jelly in the microwave or on the stove until liquefied. gently brush pears with jelly; let set, at least 20 minutes. remove tart from pan, + serve. So glad you shared this Amy-gorgeous tart! I love that it is already naturally gluten free too.nCan’t wait to try it out! You are right–this is just gorgeous! And yes, at our family holidays, the pies and goodies all sit out on display (probably just to tempt and tease all of the little ones who would rather eat dessert first–myself included, ha!). I love pears and chocolate together; I can’t wait to try this out! i love the holiday dessert table + getting to see all the awesome stuff people made. it does lay a little pressure on to make something pretty, so thankfully this fits the bill. =) if you like chocolate + pears together, i think you’ll love this! I love pears and chocolate. Like you I had never thought of them being together. I’ll have to put this on my to-try list. I am always looking for pies and tarts as one of my family members prefers pies/tarts over cakes. oh my goodness, how pretty! you are right that this would look so pretty on a thanksgiving or christmas dessert table. i’m pinning it to make for a christmas dessert! This looks lovely! I’ve never thought of using pears and chocolate before. What a great flavor combo! Since it has chocolate, I think I might even be able to get my husband to eat it! i had no idea it was gluten-free ’til my awesome reader EA pointed it out to me. i love that, because i know tons of people are g.f. these days + it can satisfy them while still being delicious to the non-g.f. people, too! OH!!! I’ve never put pears with chocolate either. This looks fantastic! We will be adding it to our Thanksgiving menu. Thanks! awesome! i actually froze half of it when i made it + i’ll thaw it out so we’ll have some on thanksgiving, too. =) hope it turns out fabulously for you! The tart is looking gorgeous and those flavours are lovely.